To ask Her Majesty’s Government what plans they have to support and promote the ethical and sustainable fashion and clothing industry. Fashion and clothing are sometimes seen as frivolous, or only of minority interest. This was brought home to me when I started asking noble Lords to join the APPG. As I frequently pointed out, however, many of your Lordships could be considered the ultimate ethical fashionistas-wearing beautifully cut, high-quality tailored suits, timeless in style and lasting several years. This is the antithesis of fast, disposable fashion, which makes it more likely to be sustainable and less likely to contribute to the 30 per cent of textile-based landfill. Perhaps more seriously, many noble Lords have interest in human rights, forced labour practices, environmental issues, international development, organic farming, corporate responsibility, animal welfare-et cetera, et cetera-and can make substantial, well-informed contributions on this subject as it touches on all these areas. Government can make very useful interventions. The sustainable clothing action plan, a Defra initiative from the previous Government, was a key development bringing together well known high-street brands to improve the sustainability performance of clothing across the supply chain. I am glad to hear that that is to continue. DfID’s responsible and accountable garments sector-RAGS-challenge fund works with the private sector and civil society to adopt ethical approaches to production in developing economies. There is another point: the power of government procurement processes. The Government are among the largest non-retail purchasers of clothes and textiles in the country and spend £691 million on wearing apparel alone. With other textile-related expenditure, the Government spend a total of £1.186 billion a year on these items. However, ethical specifications for clothes are not a core requirement in public procurement. Current standards only suggest that government procurers can award extra points in the bidding process for ethical production principles. This does not incentivise bidders to meet higher ethical standards to win government contracts. Sir Philip Green’s review of government procurement in October 2010 neglected the potential that greater centralised purchasing could have on driving up ethical standards. Do the Government have a strategy for using their potential to lead by example and to embed ethical and sustainable principles in their procurement processes? Cotton is a recurring motif throughout this subject. Cotton growing is acknowledged as an opportunity for income generation, particularly for farmers from developing counties. But there are two key issues that need to be addressed. The first is that DfID should recognise the developmental and environmental benefits of organic cotton production and fund projects to develop this sector. Secondly, and very importantly, unfair subsidies from the EU and the USA create problems for producers in developing countries. Rich countries, including the US and those in the EU, have subsidised their cotton farmers by $47 billion in the past 10 years. West African cotton farmers, who are among the poorest in the world, are forced to try to compete on a global market against this subsidised cotton. The Fairtrade Foundation is campaigning and its supporters are lobbying the UK Government and the EU to drop their subsidies and to isolate the US on this unfair practice. Defra has already indicated its opposition to trade-distorting cotton subsidies. How does the department intend to demonstrate that it is seeking to influence directly the EU Commission’s proposals on the future of cotton subsidies, or has it begun to build the necessary coalition among member states and MEPs to end this subsidy? On the other hand, we have the absolutely deplorable situation in Uzbekistan where the Government force children from the age of 11 to harvest cotton from September to November every year. In January 2011, the Council of the European Union announced that it had agreed changes to the EU-Uzbekistan Partnership and Cooperation Agreement protocol with Uzbekistan to extend the provisions of this PCA to the trade in textiles. These have yet to be approved by the European Parliament. This is an opportunity to call on the Parliament at the very least to ensure that the provisions of this agreement are conditional on Uzbekistan ending this practice. I note that the honourable Member for St Austell and Newquay has tabled an Early Day Motion on this subject. Through diligent campaigning, PETA-People for the Ethical Treatment of Animals-has helped to ensure that items of regimental apparel have been replaced by synthetic material. There remains the issue of the Queen’s Guards caps. I understand that they are still made from the pelt of Canadian bears which are treated cruelly in order to produce this material. Following a meeting last year, there has been some progress, and there is now an agreement to develop more refined samples to test with the regiments that wear the ceremonial caps. That process seems slow and an update would be helpful. Finally, for those of us who have occasion to wear ceremonial robes, I understand that the fur trimmings have been switched from ermine to rabbit. But that is still fur. I know that although many Members of your Lordships’ House-like the overwhelming majority of Britons: 95 per cent, according to one poll-would not dream of wearing fur coats or any other fur garments, some may not question wearing those wonderful red robes with the fur attached. 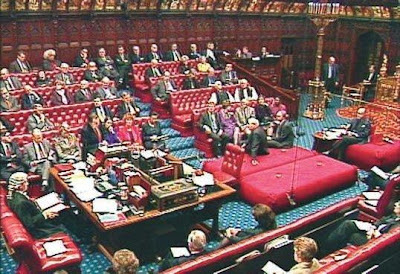 A representative from Parliament has informed PETA that Peers can choose new robes, manufactured by Ede & Ravenscroft, which contain only synthetic fur, therefore making it very easy to make the humane decision to wear a guaranteed cruelty-free faux fur robe.